‘Lover’s Walk’ – A track through Inverloch’s foreshore reserve. From a postcard circa 1906 titled ‘In the tea tree, Inverloch’ by G.Ford, Leongatha. These stories and notes were collected by Mrs. E.P. 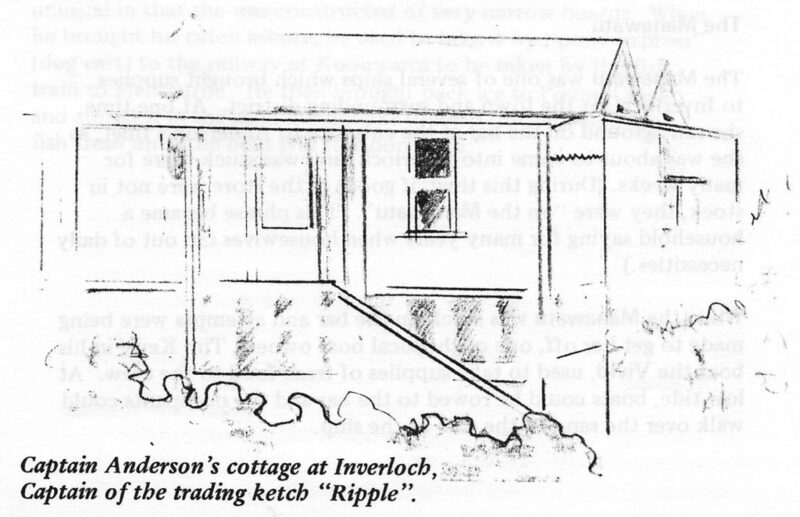 Brewster of Inverloch, and originally published in the Inverloch Community Newsletter published monthly at Inverloch. They have been re-edited by Jean Crawford, formerly of Leongatha, for the Leongatha Historical Society 1980. The illustrations are by Pat Dale of Leongatha. In 1835, just six weeks after Batman and Fawkner found their “place for a village” in Port Phillip Bay, the land along the coast between the Bass River and the Tarwin River was taken up by Samuel Anderson. He was joined later by his two brothers from Scotland. In June 1840, Anderson sailed round the coast towards Wilson’s Promontory and noted the large inlet that was almost blocked by a sand-bar. In November of that year, Governor La Trobe sent Assistant Surveyor Townsend and a survey party to map the inlet. The party anchored its cutter outside the bar, goods were rowed ashore, and a camp was established on the spot where Inverloch now stands. Several days were spent exploring the inlet and rowing up the lower reaches of the Tarwin River. These were the first white men to record the beauty of the area and to note the abundance of bird life. Townsend named the settlement Anderson’s Inlet, and Townsend’s Bluff, east of the town, is named after him. Between 1841 and 1846, the Smythe brothers surveyed the Victorian coastline, and George Douglas Smythe surveyed that part from Cape Liptrap to Cape Paterson (these two points previously named by Lieutenant Grant in 1800 and 1801) and he appears to have named Eagle’s Nest, Petrel Rock and Point Smythe. 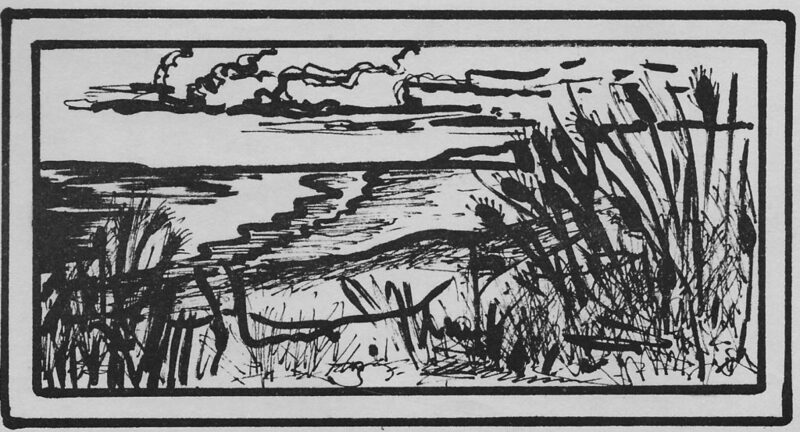 At one stage, the area around the inlet was part of Black’s Run – from Tarwin Meadows to the Clump (where Wonthaggi now stands). When selection took place in the 1870’s, the Henderson brothers were the first on the inlet. Until settlement took place to the north, with the subsequent development of tracks through the great forest, all access to the area was from the sea, and visits from the boats which brought six months’ supply of stores for the settlers were infrequent. These boats called at the jetties which were built at Inverloch, Maher’s Landing, and Tarwin Lower, and took away the settlers’ produce of potatoes, butter, hides, wattle bark, bone dust and wool. In 1883, Anderson’s Inlet Post Office opened but, six years later, the name was changed to Inverloch, although for very many years the area was known as Anderson’s Inlet. The state school was established in 1886 and, in 1897, the Mechanics’ Institute and Public Library was built through funds raised by the local population. 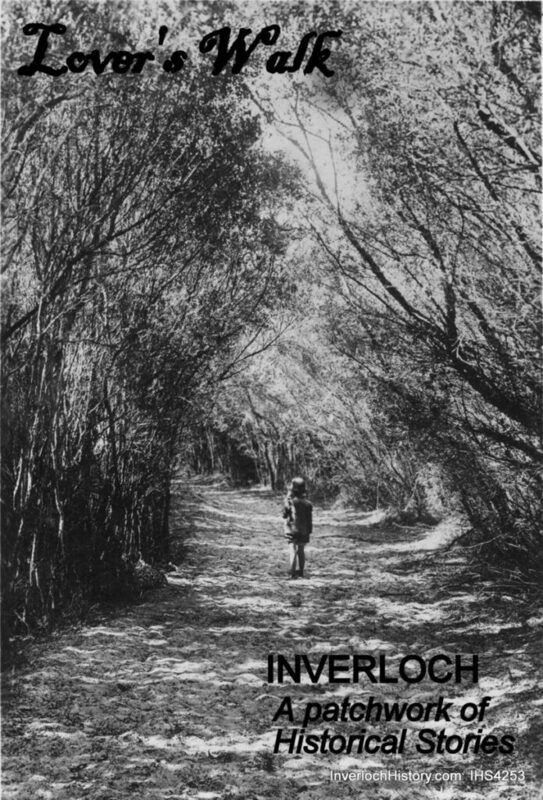 By the end of the century, Inverloch was established as a fishing port and a holiday resort. Holidaymakers still came mainly by sea although once the Great Southern Railway reached Whitelaw passengers could alight at that spot and travel to Inverloch on horseback or, later, by the livery coach. When the Powlett coalfield was opened up, coal was brought to Inverloch and shipped to Melbourne, until Wonthaggi was established and the railway-line from Nyora was extended to the new coal town. The coal traffic, and the miners and their families, provided further development for Inverloch as some of the Wonthaggi families became holiday visitors to Inverloch, and many eventually settled at, or retired to, the town. After World War 1, a Foreshore Committee was formed and, for fifty years, did much to develop the coastal area for visitors. In the early years, development consisted of providing wells and shelter sheds for the use of campers, and changing sheds and two enclosed bathing places. Later, toilets and camp-sites were established. Since 1977, the Lands Department has administered the foreshore and continues to provide for the comfort and pleasure of either day visitors or campers. 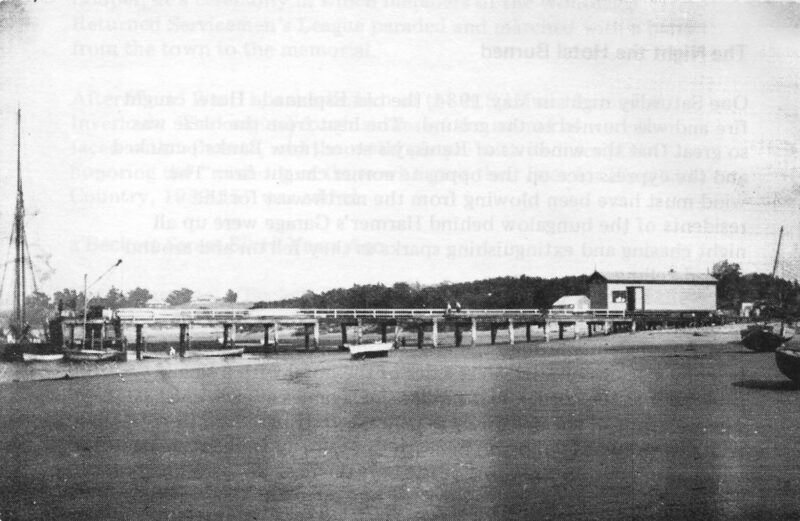 Once the jetty at Inverloch had been widened and strengthened to take the coal loads, and bridge work and road formation had taken place on the track from Wonthaggi to Inverloch, there was a constant hauling of coal until the railway-line had been extended from Woolamai to the mining area. At Inverloch, the entrance to the jetty was no longer along the government road from Wonthaggi and down Pier Road, but via a new track which had been cut through the tea-tree from the hotel to the jetty. Logs were bolted together to form the sides of this track, cut manuka was laid across the track, and stone put on top of this. The coal was hauled by bullock teams and horse dray, and by a fearful machine known to the locals as “Treading Alice” which had continuous tracks (a forerunner of caterpillar tractors) and could only travel in a straight line. So, whenever she had to go round a bend in the track, she had to be jacked round with Trewhalla jacks. She could be driven across sand, and could take four tons of coal at a load. As she was extremely noisy and could be heard some miles distant. Inverloch residents always knew when she was coming. Miners Cottage. Moved to Inverloch as a holiday house. After the railway-line to Wonthaggi was used to transport the coal to Melbourne, Inverloch again became a quiet holiday and fishing area. Many of the holidaymakers now came from Wonthaggi, as miners and their families came to camp and eventually buy blocks of land at Inverloch on which to build either holiday cottages or permanent homes from which they could travel to work each day. Often families came for the Christmas holidays, and the mother and children would stay until Easter (with the children attending Inverloch school) while the breadwinner spent the working week at Wonthaggi and the weekends at Inverloch. During the mine strike of 1925, at least one Wonthaggi family spent six weeks camped at Inverloch in a tent measuring six feet by eight feet. Early photographs of Inverloch show the one telephone wire which, for many years, was the only direct link with other areas. Early in the 1900’s, a series of boating accidents, in which Inverloch residents were involved, occurred eastward along the coast from Point Smythe. News of the fate of these people took many days to reach Inverloch as those who came ashore safely had to travel inland until they reached a telephone line by which they could get the news to Outtrim. Then the news would be conveyed by messenger on horseback. But, as the return trip by horse from Outtrim to Inverloch took twelve hours (so bad were the tracks) still further delay took place. Eventually, several local residents agreed to be guarantors for the telephone line and a single line was brought from Outtrim on fence posts, over gateways, and along trees, until it reached the Post Office, which was at Vietz’s Store in A’Beckett Street. During the 1890’s it was decided to build a Mechanic’s Institute for lnverloch. Mr. & Mrs. Wyeth organised the first concert to raise funds for the building of the hall. This concert raised seventy-five pounds. A Mr. Youll planned the building and a Mr. Nation, from Melbourne, was the builder in 1897. Several of the Institute’s minute books between 1897 and 1945 are missing, but those still in existence make interesting reading. For instance, in 1914, the secretary/caretaker’s remuneration was 20 per cent of the gross receipts for the use of the hall. Leasing prices were one pound for a whole night and ten and Sixpence for a half night. The prices charged for concerts were two shillings and one shilling. Admission prices for dances were three and Sixpence for gentlemen, and ladies provided supper. During this year (1914) flooring and re-blocking were authorised, the fences were painted (with three coats of paint), the wires were restrained, the windows were frosted, three lamps were installed, and a tin of benzine was purchased. In 1915, the charges set for the use of the hall for church services were one shilling for a morning service and two and Sixpence for an evening service. That year, new cups and saucers were bought, the piano was tuned for twelve and Sixpence, and the secretary’s remuneration was altered to five pounds per annum. An overdraft was requested from the Colonial Bank in Wonthaggi, but a loan of twenty~seven pounds was raised locally at 7½ per cent interest, which was lower than the bank rate. The following year, old books were sent to the Red Cross for distribution to soldiers, there was a reduction in the committee numbers and in the quorum numbers necessary for meetings, and personal loans at 5% interest were taken out to pay off the previous year’s loan of twenty-seven pounds. Mention is made of the new books which were purchased from various sources every few years and of the boxes of books on loan from the Melbourne Public Library. At one stage, there were more than 2.000 books in the library. In 1919, new seats were bought at the cost of one pound five shillings each, or five for one pound each. Mantles and globes and rings were purchased for the lamps but, apparently, these were not very satisfactory because, the next year, the old kerosene lamps were installed as a standby! In that year, there was a charge of one shilling per hour for the use of the piano for practice and, the following year, a minute was passed to the effect that the piano was not to be removed from the hall for any purpose whatever. A variety of entertainment was held for fund-raising for both hall funds and other groups. Cups and saucers continued to be replaced over the years, scrub had to be cut, fencing done, windows frosted, and general maintenance on the building continued. At one time, all local committees were allowed use of the back room free of charge, and all users of the hall were told that nails were not to be driven into the floor! New charges were set in 1922 for the use of the hall for auctions, vaudeville shows and conventions. In 1924, the Anglican Church requested permission to remove its organ. This was granted on condition that the church reimburse the hall committee for the money that had been spent on the organ’s insurance. Six months later, the church was still using the hall and being allowed one hall lamp at a charge of Sixpence per service. About this time, the Anglican Church building must have been finished at Inverloch and the organ removed, for, in February 1925, the Methodist Church Trustees asked permission to place their organ in the hall – the hall committee to take no responsibility for it. The minutes for the next twenty years are missing, but it is assumed that this organ was removed from the hall when the Methodist Church building was erected. In 1934 State Electricity Commission (SEC) power became available. When Mr. C. Wyeth built Pine Lodge in 1930, he installed a generating plant to supply power for lighting. On special occasions, a wire was connected to the hall for electric lights and, for five years, a line was connected to the jetty for street lights. In 1934, the SEC brought a single-phase line from Kongwak to Inverloch for light and power, and this was used until 1947 when it was replaced by a three-phase line. The hall records, from 1945 until the Deeds of the Hall were handed to the Shire of Woorayl in 1974 and the final minutes written, continue to mirror some of the social life of the Inverloch community and the efforts made by the committee members to maintain the hall. The records also reflect rising costs over the years, as the rental charges rose from ten and sixpence for a half night in 1914 to one pound for a vaudeville entertainment in 1922. When the Badminton Club was allowed the use of the hall in 1948 it was charged ten shillings per night and allowed to take the streamers down. The next year, it was charged twelve shillings to use the hall two nights per week and again allowed to take down streamers. This must have been an annual undecorating after the summer dance season for, in 1952, it was again given permission to take down streamers. Most committee meetings were concerned with maintenance of some sort: spouting and tanks which needed replacing or repairing; toilets (of various types) needing to be built or repaired (Shire pan fees rose from nine pounds in 1955 to forty pounds in 1966); lights and their replacements – six lights were installed in 1949 for ten pounds and, in 1955, the 150 watt globes in the hall were replaced by six fluorescent lights; and scrub around the hall needing frequent cutting (in 1946, a letter had to be written to the Methodist Church authorities concerning the danger of fire on their land). Piano-tuning and repairs were often mentioned and a new piano was purchased for one hundred and ten pounds in 1949. Painting recurred – one coat on the roof cost six pounds in 1923 but, thirty years later, the entire exterior was painted for two hundred and thirty-eight pounds. Ration cards were distributed at the hall in 1946. Letters of thanks were sent to former librarians; to local constables for their help in maintaining order at the summer dances; and minutes of appreciation record the work done by a succession of committee members over eighty-one years. This historic building was burnt down early on the morning of the 30th of July, 1978. A few miles north-east of Inverloch there is an avenue of ancient pine trees which leads to the site of an early settler’s cottage. Two old pear trees, some mounds of earth, a few odd bricks and several pieces of galvanised iron are all that show the place of this hardy German bachelor’s cottage. In 1880, he and his brother-in-law came to Gippsland to select two adjoining blocks of land. Both were diligent workers who cleared as much of their land as they could. They were soon able to milk a few cows and to keep a few pigs. After the cream had been allowed to set on pans of milk, it was scalded and kept for four or five days until there was enough for making butter. The “whiskers” were then skimmed off the stored cream before the butter was made. After the Outtrim mines were opened this butter was taken there and sold to the miners’ families. Each Sunday afternoon, “Unk”, the bachelor, would dress in his best clothes (a suit and tie), walk down his avenue of young pine trees, cross two creeks, and walk up the hill to visit his sister and brother-in-law and their family on the farm. They would be waiting for him on their verandah, and the afternoon was spent talking, playing gramophone records. drinking coffee and chewing boiled sweets. One of the adjoining blocks of land which were selected by these two German settlers in 1880 was bounded by Stuchberry’s Road. It was here that Grandfather Vietz gradually cleared the bush and built, first, a hut in which he lived while he built a house to which he could bring his wife and two young sons. He planted an avenue of trees, one side of cypress and the other of oak, which led from the house site to the road. As well, he planted a large orchard with many varieties of fruit trees. Many of these aged cypress, oak and pear trees still stand near the spot where he built his house. One son later worked at one of the Outtrim mines and was killed in an accident there. The other son married during the 1890’s and went to the declining gold-mining town of Omeo where he kept a store and cafe. About 1900, he returned to South Gippsland with his wife and three children to become storekeeper and baker at Inverloch. Four more children were born while the family was at Inverloch. Once this son and growing family were settled at lnverloch, Grandfather used to drive into the town each Saturday in his horse and cart bringing fruit for the family and feed for their pigs (kept behind the store in a’Beckett Street). Then he would collect his stores and return to the farm, sometimes taking young grandchildren to stay until his next trip to Inverloch. Holidays on the farm were full of excitement for there were wooden clogs for wearing in the house as muddy footwear was left on the verandah. Also on the verandah was a supply of snake sticks to be used on trips to the somewhat distant toilet where there was always the possibility of meeting a black “whip” snake! Oats were grown for grain for the hens and ducks and the children would play “Indians” through the crop. The large orchard had apples, pears, plums, peaches, and quinces, with grape-vines growing along the fences; while the pig-sty had Wisteria growing over it. A log shed was built as a cool store for the fruit, and the duck-pond was formed by a ring of logs driven vertically into the ground. This same method of vertical, log fencing was used later to form a rabbit-proof fence when rabbits arrived in the district, although near the house there were earlier, animal-proof fences of palings held by two twisted wires at the top and bottom of each paling. Many of the logs so used came from Grandfather’s pine plantation. When the trees were cut down, the stumps that were left made ideal nest sites for the hens. Collecting eggs from these nests was one of the holiday delights! Great care must be taken in preparing meat for salting. It must be examined carefully to see that it is fresh and good, then wiped, sprinkled with salt and afterwards left to drain a few hours before it is rubbed with salt. The meat will thus be thoroughly cleansed from the blood, which will prevent it from turning and tasting strong. It should then be placed in the pickling pan and turned every morning, and also rubbed with the pickle. The cover of the pickling pan should fit closely and have a weight on it to keep it down. For a pig weighing 280 lbs. you require 20 lbs. of salt, ½ lb. saltpetre, 4 lbs. coarse sugar. Cover the bottom of the tub with salt. Cut off the hams, shoulders, spareribs and griskins of the pig. Rub the remaining part of the pork with the aforementioned ingredients, lay it in a tub with salt between each layer and in 3-4 days, if the brine from the pork no longer covers it, make a solution of 2 lbs. salt; ¼ oz. saltpetre, to a quart of water, boil for ½ hour and when cold pour over the pork. Do not allow the meat to “swim ” in the brine by making sure that the lid is weighted down. The pork should keep for 2 years if pickled in this way. 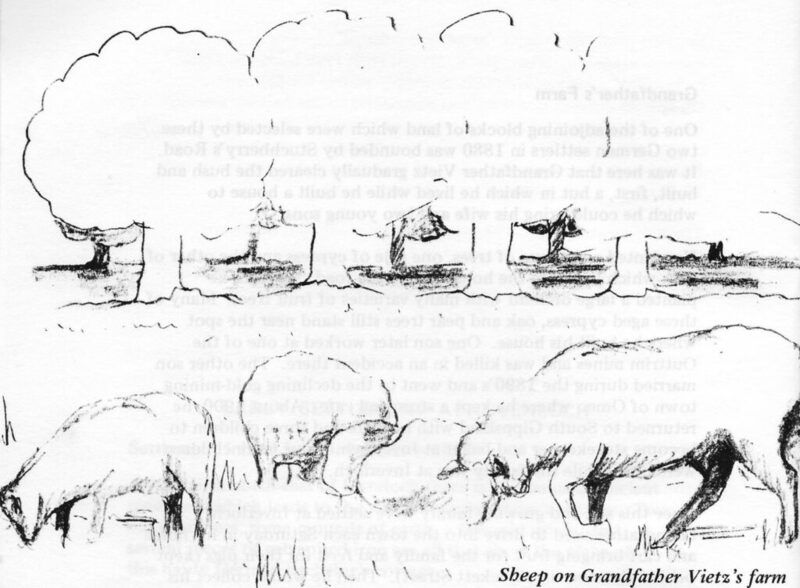 As well as cows, milk which provided the skim milk for pigs and the cream to be made into butter for the Outtrim folk, sheep and cattle were kept, along with the pigs, to supply meat for the family. The salt pork was stored in wooden beer-barrels in a log store-house, and Grandmother made strings and strings of sausages. Grandfather rose early and worked hard and his morning tea amazed his grandchildren – a large cup of coffee with two eggs beaten into it, plus a thick slice of Grandmother’s plum cake. Plum cake and scalded cream at the farm were long remembered. Grandmother also worked hard both indoors and out, and one of the marvels of her activities was the “kerosene fire cylinder” which she used for lighting the fires when it was time to burn the scrub. When he was carting goods to Inverloch or Outtrim, Grandfather used to load the spring cart and harness one of his work horses, but for Sundays or special Occasions, such as Regatta Day (New Year’s Day), he kept a beautiful, four-seater buggy and two white horses – Maybelle and Gaybelle. Then his grandchildren were so proud to be collected and driven, in state, to the jetty to watch all the exciting activities there and on the beach. 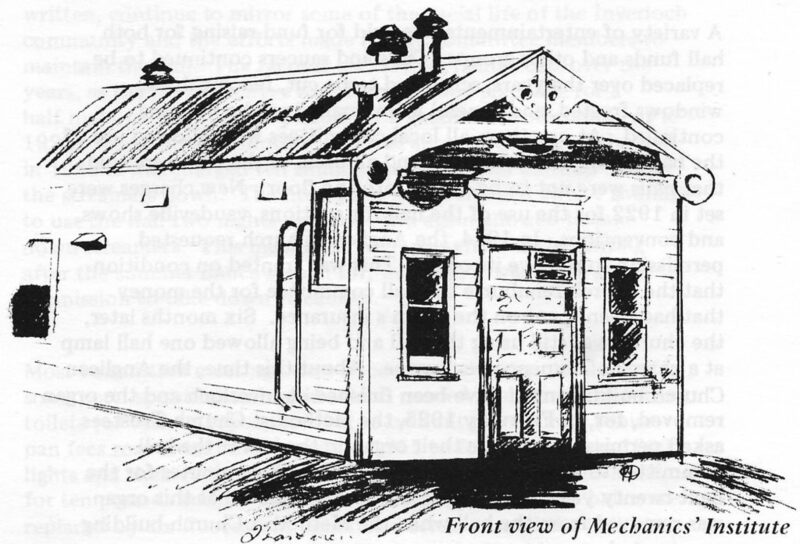 Some of Inverloch’s early history appeared with the demolition of the building below Cross’s store in A’Beckett Street. The first recorded dwelling on that site was built about 1890 for the Kidd family and consisted of two front rooms below a gable roof with the later addition of two more rooms under a skillion roof. 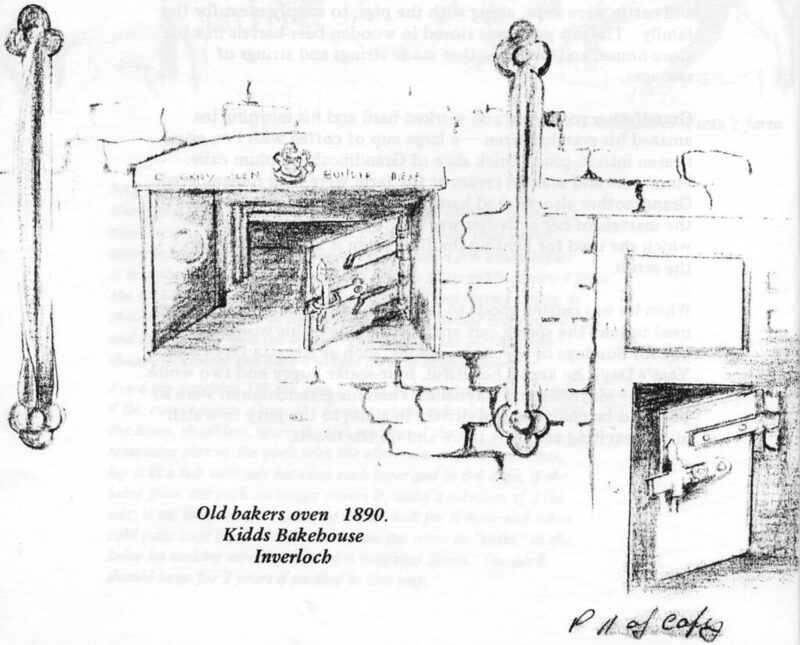 A separate bakehouse with a large baker’s oven was built in the yard behind this dwelling. Later, a verandah and a small room were built onto the front of the four rooms, and this room served as the Post and Telegraph Office and as an agency of the Commonwealth Bank. About 1900, Charles Vietz and his wife and three young children came from Omeo (where he had been storekeeper and cafe proprietor) to become Inverloch’s storekeeper, baker, and postmaster. Four more children were born in the front room of the small house. As demolition proceeded, three different layers of wallpaper have been removed from beneath the plywood panelling which was the most recent wall covering in this front room. A pale-pink, shell-patterned paper with a floral frieze around the top of the walls was covering a dark-green paper with posies of pink-and-yellow flowers. This paper was probably put on during the Vietz family’s residence for, below it, as part of the lining, were old newspapers printed in German. Part of this earliest lining paper was also made up of old copies of The Sketch dating from 1894 to 1897. Beneath these several layers were the fine tongue-and-groove lining-boards which had first covered the wall frame. It was during the time that C.H. Vietz was storekeeper that an extra store-room was added above the large building which served as the store. This new building was used for grain and fuel. A switchboard was added to the small front room which was used as the post office when more telephones were installed in Inverloch. During World War 1 there was considerable prejudice against persons of German descent, and it was at this time that the Vietz family left Inverloch. The store and residence were purchased by a Mr. Bartlett, who also had a large family, and more additions were made to the house. It was he who built the two upstairs rooms and passage. This addition showed great ingenuity on the part of the builder, for both the frame and the wall linings were of “bits and pieces” with a weatherboard exterior. The pieces of wood used for the linings were of old, wooden packing-cases in which goods had been delivered to the store at “Inverloch Port per Ripple”. Some of these old pieces of wood had been cases of Silver Star Starch, White Rose Oil, Vacuum Oil, and Kitchen ’s Electrine Safety Matches. There were other boards labelled “C.H. Vietz”, and still more with brands from overseas – Buchanan Bros. Ltd., Confectioners, of Glasgow; Beck’s Lager Beer, from Germany; and Celebrated Beaver Brand Guinness Beer. All these pieces of packing-cases were in different lengths and had been fitted together as a huge jigsaw to make a cosy, weatherproof house. The walls and the ceilings had been insulated – with folded copies of the newspapers of the day which had been unsold at the store. Early this century, the children of Inverloch had special nicknames for some of the distinctive buildings around the town. There was “Canary Cottage” which was “away in the scrub” (now in a well-settled part of the town): “The Bandstand” (then, and now, near the centre of Inverloch); and “The Castle” (high on a hill, but destroyed by fire in the 1950’s). One of the daughters of an Inverloch policeman of this time, remembers as one of the escapades of her childhood, stealing pears from the garden at “The Castle”. 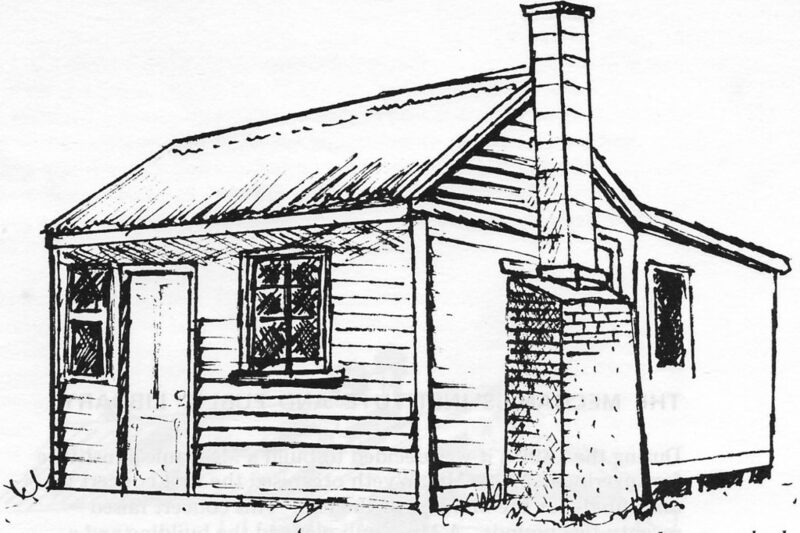 “The Pill Box” was Inverloch’s first prefabricated house. About 1906 or 1907 it was brought by boat, and then loaded onto a bullock-wagon to be taken up the hill to where it was erected. When one of the local builders saw the load with the walls packed flat on the floor, he was dismayed for he thought that it would be the end of the building industry! Can anyone add other nicknames to this list? Before the Mechanics’ Institute Hall was built in 1897, church services of the different denominations were held in private homes. But, after that date, until their own buildings were available, services were held in the hall. The Roman Catholic Church was the first to erect its own building in Scarborough Street. This building suffered in a wind storm during World War 1, but it was propped up again and used until it was replaced by the present building in the late 1960’s. After the Anglican Church built its place of worship in The Crescent, in 1924, its organ was moved there from the hall where it had been used for services, and the Methodist Church was allowed to place its organ in the hall. In 1923, the Methodist Church purchased the original school site in A’Beckett Street and, in 1928, purchased the former North Wonthaggi Methodist Church and brought it to this site. This building was dedicated and opened for worship in 1930 but, by February 1932, it was too small for the increased attendance at evening services. Today, it is known as Wesley Hall and stands at the rear of the present church building. When the Methodist Church building at Jumbunna was for sale, it was bought by the Inverloch Methodist Church and moved to its present site where it is still used for services of the Uniting Church. In 1956, a fete was held in the grounds of Pine Lodge and the proceeds were shared between the Anglican and Presbyterian Churches. This enabled the members of the Presbyterian Church to buy the former Outtrim Church and bring it to William Street where two building blocks had previously been purchased in preparation for the erection of a building. Near the concrete steps which lead from the car park beside the bowling green to deep water are two, old, wooden piles. These were once part of the outer fence of Inverloch’s shark-proof, bathing enclosure. This was built early this century by Bowen the shipbuilder. He cast cement blocks on the beach and put them in the sand at the outer edge of the enclosure. These blocks had holes in them into which the upright piles were dropped. Cross timbers were then bolted to these before the fence timbers were attached. Old photographs show bathers in the bathing garments fashionable of the time (before World War 1) enjoying the safety of swimming in these baths. Older residents can recall swimming there. Others remember learning to swim beside the jetty before the baths were 7 built. Sharks were supposedly plentiful in the inlet in those early days and there are records of seals outside the baths fence. For the first few years after the baths were built the outer timbers were removed for winter each year. Working-bees using horse and scoop were held each spring to remove the sand which was deposited each winter, and then the timber was replaced for the fence. But, after a few years, enthusiasm waned, and finally the baths fell into disrepair. The area silted up, and so the bowling green and car park were established over the spot Where so many people had spent many happy summer hours. In the early years of this century, when Inverloch was still regularly serviced by shipping for the transport of goods and passengers from Melbourne to the town and surrounding district, a “Rocket Brigade” was formed which would be used for rescues in shipping and boating emergencies. Members of the brigade came from as far away as Pound Creek for Thursday evening practices. 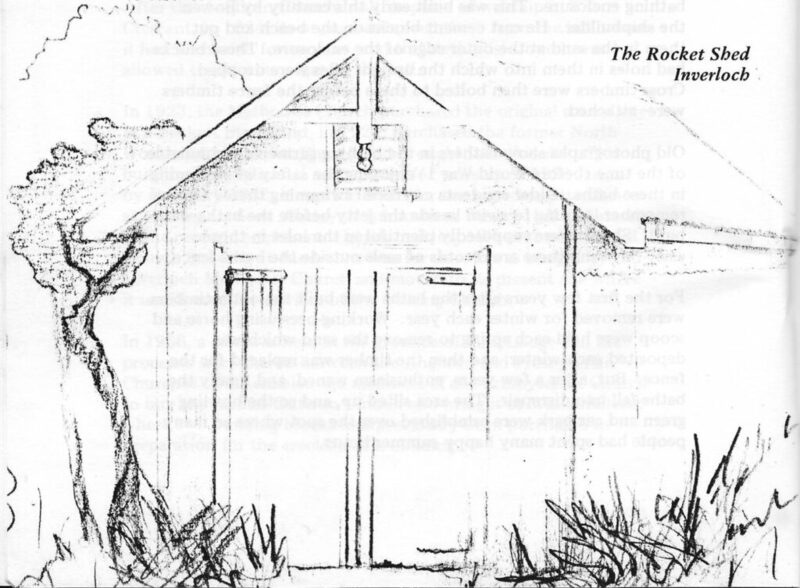 The Rocket Shed, which held the equipment of fine silk lines, heavier cords and ropes, the rockets, and the rescue boat, stood beside the track which ran from the hotel to the jetty. Another shed stood on Point Smythe and members would row across there for practice, as well as-lighting the rockets on the beach on the town side of the inlet. An early photograph. shows Inverloch’s disaster boat, The Louisa, with two brigade members. On the only occasion on which the brigade was called out for a serious rescue, one of the crew members was shot overboard with the spare rope from the rocket around his leg. In the excitement, the members of the brigade themselves were wrecked and were finally rescued by the crew of the vessel which they had set out to rescue! Melbourne to Inverloch for “Five Bob”! Before rail and road travel to Inverloch became the main way of reaching the town, most people, and freight, for Anderson’s Inlet and Outtrim came by sea. Goods were loaded onto The Ripple, and other coastal trading vessels, at the Little Dock near Spencer Street in Melbourne, for the overnight trip. At one time, it was possible to sail from Melbourne to Inverloch, via Western Port Bay, with all meals supplied, for five shillings. Passengers were well cared for – and they could bring their dogs as well. All for “five bob”! Captain Anderson’s cottage at Inverloch. Captain of the trading ketcb “Ripple”. One of the steamers which brought supplies to Inverloch in the course of its run along the coast to Lakes Entrance was the Despatch of 237 tons. She had been built in 1869. On one visit to Inverloch, she ran aground on the sandbank which was then off the end of the pier. This unlucky vessel managed to float off on a very high tide and continue her trading. But, in September, 1911, in very rough weather, she struck the pier at Lakes Entrance and sank. No lives were lost. The Wyrallah, of 302 tons, was another vessel which brought supplies into Anderson’s Inlet and to other places along the coast on the Lakes Entrance run. In 1924, she collided with another boat in the Rip at the entrance to Port Phillip Bay and, unhappily, three lives were lost. While the Manawatu was stuck on the bar and attempts were being made to get her off, one of the‘local boat owners, Tim Keys, in his boat the Vivid, used to take supplies of fresh food to-the crew. At low tide, boats could be rowed to the bar and the occupants could walk over the sand to the side of the ship. Eventually, the Manawatu was winched off the bar by means of a cable from a winch in her bow connected to a two ton anchor which had been sunk in deep water off the bar well ahead of her. Each day, as the tide came in, steam was raised and she was pulled a little further towards the edge of the bar, until she was clear and once more afloat. A local fisherman, Charlie Neuman (later Newman) built his boat The Traveller, which he used for fishing, on a “slip” which used to be between Pound Creek and Inverloch. The Traveller was unusual in that she was constructed of very narrow boards. When he brought his catch ashore, he used to take it by “pony express” (dog cart) to the railway at Koonwarra to be taken by the fish train to Melbourne. He then brought back ice to Pound Creek and stored it in the sand hummocks to keep further catches of fish fresh until the next trip to Koonwarra. In the years before Federation, when Inverloch was quite a busy port with its own Customs House, and vessels calling regularly with supplies from Melbourne, from interstate, or from overseas, there was considerable trade through the town. Supplies were brought for the town, and goods were carted inland to settlers in the forest, to Outtrim in its mining heyday, and to the construction workers on the Great Southern Railway Line. Banking facilities were, of course, necessary in the town and a branch of the Bank of Australasia was established in a building near the top of a’Beckett Street, which later became Ullathorne’s shop and, still later, Sparkes’ butcher shop. From 1889 to 1891, a Mr. R..S.P.B. Jones was the manager of the bank, nicknamed and known as “Raspberry Jones”. 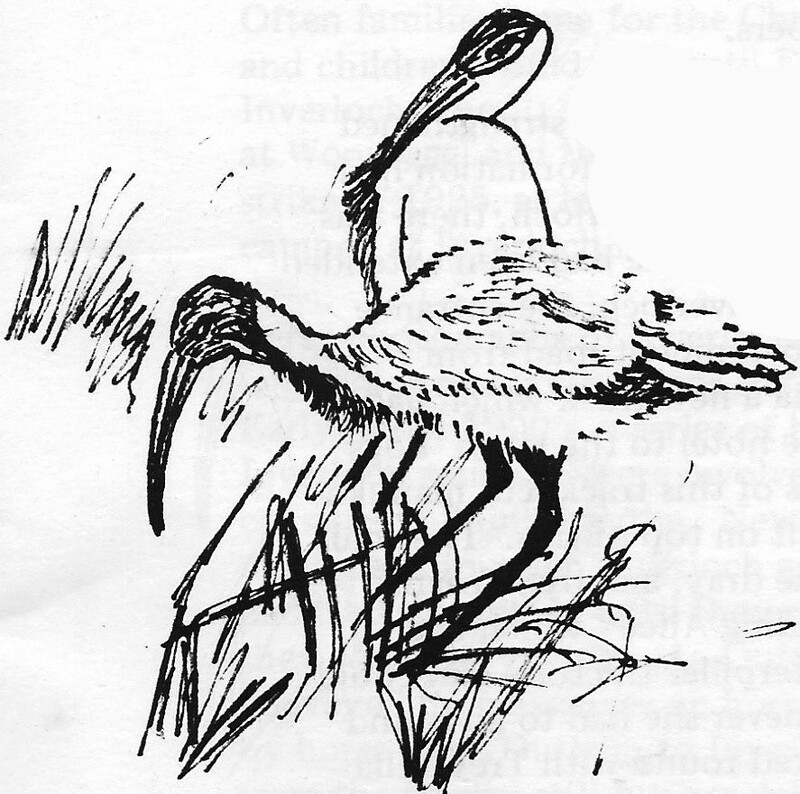 Early this century, one of the highlights of life for the children of Inverloch (and possibly for the adults, too) was the visit of the Indian hawkers. One of these travelling salesmen is remembered as having two horses: one which he rode, and the other which was a pack-horse heavily laden with all the goods in stock – materials, clothing, needles, pins, thread, and an all pervading smell of mothballs and citronella. A later hawker is remembered as having a large turban and a big, black beard. He. had Indian women with him who wore very long aprons. They travelled in a covered cart and the storekeeper’s wife bought bolts of material from them while her children were thrilled to View the great variety of other treasures which he had for sale. Early in the 1900’s, Inverloch’s baker had a horse named Punch which pulled the delivery cart. From all accounts, Punch was as colorful a character as many of his human contemporaries. On one occasion, he reached into the cart and took the baker’s money bag. Another time, he pushed the baker who was carrying a bag of flour – with a resulting floury snowstorm. Punch must have also had a sweet tooth, for his most famous misdemeanor took place on the day when he got into the bakehouse and ate the jam and sugar tops from a cooling tray of Albert buns. After several years of life at Inverloch, Punch was finally sold to a circus where his pranks were probably greatly enjoyed. Raspberry Vinegar at the Pub! During the years when the only telephone line to Inverloch ran to the post office (which was the boarded-in verandah at Vietz’s store), one of the highlights of life for the Vietz children was to deliver a telegram to “Daddy” Lohr who kept the hotel. This large gentleman always wore a cream, Tussore silk suit and a straw hat. To keep his bar trade separate from the guests accommodation, the bar was situated in a small addition on the north side of the main building, and the bar itself was circular so that “Daddy” Lohr stood in the middle dispensing refreshment. When any of the Vietz children delivered a telegram to “Daddy” Lohr, they were given half-a-crown and a drink of raspberry vinegar which they sipped in the bar. It was the same raspberry vinegar sold at their father’s store, but it tested so much better when they drank it at the pub! One of Inverloch’s early residents is remembered as having an easy solution to the dish-washing problem. Every so often his wife and daughter would be away, and although he was quite happy to prepare meals he obviously did not like washing dishes. After each meal, he would put each used item of crockery into an outdoor rainwater barrel. If his wife was away for longer than the supply of crockery, he would go to the store and buy more. When the boat brought his wife back from her visits away she, no doubt had the best supply of cups and plates in town. 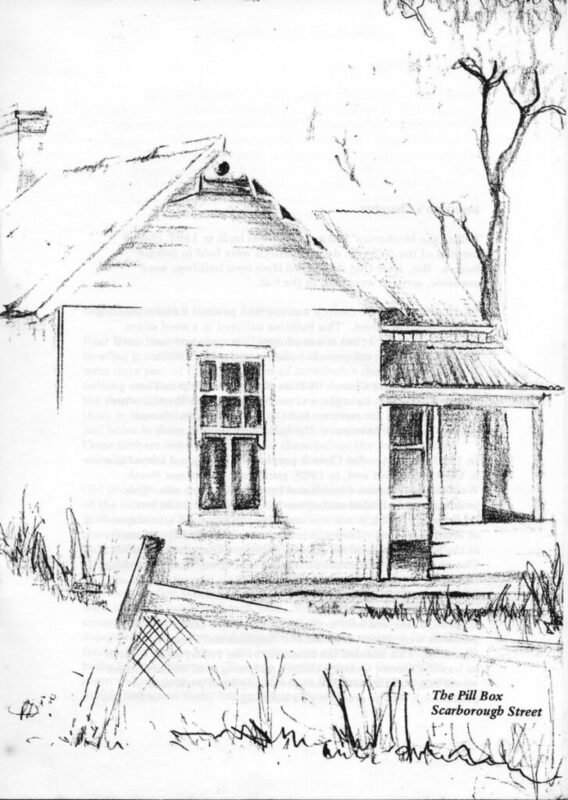 In the days when Inverloch Hall was still surrounded by thick tea-tree scrub, school, with the late Miss E. Ruttle as teacher, was held in a back room of the hall.- When gypsies visited the town they used to camp alongside the school in the paddock of tea-tree in Reilly Street, which Was then just a track through the scrub. The late Mrs. Edwardes (nee Dot Vietz) remembered them as wearing bands across their foreheads tied at the back over their hair, which was worn longer than the style in those days. Although Dot Vietz lived at the store in a’Beckett Street, it was a fearsome adventure to go to school through the scrub just the short distance alongside the hall when the gypsies were there But there were compensations – for while the gypsies were in the town they would give concerts which delighted all those who attended, and which gave the schoolchildren ideas for games and fun for many days after the gypsies’ visits. During World War 1, a number of men from Inverloch served with the forces and, in 1931, the schoolchildren of the town collected beach stones to build a. memorial. These were set into concrete around a marble slab, with the inscription “Commemorating Inverloch Volunteers, Great War 1914-18”. The site was then dedicated and consecrated by the then Anglican Vicar, Reverend Cooper, at a ceremony in which members of the Wonthaggi Returned Servicemen’s League paraded and marched with a band from the town to the memorial. After World War 11, a sub-branch of the R.S.L. was formed at Inverloch. The original rough stones of the memorial were then faced with concrete, and the metal plaque with its inscription honoring the “memory of those who gave their lives for King and Country, 1939-45” was added. Sixty years ago, a’Beckett Street had “Daddy” Lohr’s pub at the bottom of the street on the same site as the present Esplanade Hotel, and Neil’s Hotel at the top, in Sandymount Avenue, facing down a’Beckett Street. To give a firmer surface for the horses and buggies which used the street, rough metal (stone) was placed on it. One of “Daddy” Lohr’s jokes on the children of the town was to tell them that he would give then five pounds if they could run barefoot from his place to Neil’s Hotel. They often tried in the hope of gaining that small fortune… but they were never able to run all the way up the rough road. Early in the 1930’s, the Seagulls basketball team was formed at Inverloch. Several of our older citizens were members of the Seagulls which played against teams from Wonthaggi and Leongatha. Their uniform, which they remember with pride, consisted of orange shirts and “split” skirts (culotte style) of navy-blue – very smart and advanced for young ladies in those days, but so demure beside present-day netball “garb”. The team disbanded after the outbreak of the 1939 war. Can anyone provide the names of the original and early members of the Seagulls? One Saturday night in May 1934, the old Esplanade Hotel caught fire and was burned to the ground. The heat from the blaze was so great that the windows of Ramsay’s store (now Banks’) cracked and the cypress tree on the opposite corner caught fire. The wind must have been blowing from the north-west for the residents of the bungalow behind Harmer’s Garage were up all night chasing and extinguishing sparks as they fell on and around their dwelling. Photographs taken of the hotel in the early 1900’s show the first-floor balcony around the large, wooden building. This balcony was on the two street sides of the hotel with a small, gable roof at the corner, and similar small gables at each end. The iron roof of the balcony was painted in stripes, each the width of the sheets of iron. Beneath the balcony were creepers which also grew on the front of the bar (the next door building). This early photograph also shows the one telephone line which came into Inverloch from Outtrim. Another photograph, taken late in the 1920’s, shows tourer cars in a’Beckett Street, a gas light stand on the corner, no creepers on the hotel, and the cypress tree (which burned on the night of the fire) as a well grown shade tree. Subjects: Victoria. Inverloch, to ca 1950. Inverloch (Vic.) — History. ISBN 0959323104. Dewey Number 994.5/​6. Libraries Australia ID 1867742.